The 6-act play "Keisei Yamato Zôshi" was written directly for Kabuki by the playwright Namiki Gohê, with the help of Namiki Jûsuke and Tsutsui Hanji. It was produced in the 1st lunar month of 1784 by the zamoto Arashi Tanin in Ôsaka at the Naka no Shibai [casting]. The original musical accompaniment was in the Miyazono style. It changed to Gidayû when the drama was adapted to the puppet theater. The drama and its michiyuki went to oblivion from the beginning of the Meiji era. It was revived for the puppet theater in October 1955 and, using the script written for the puppets, adapted for Kabuki in July 1956 at the Kabukiza, starring Matsumoto Kôshirô VIII and Nakamura Utaemon VI in the roles of Sukekuni and Komaki. Takechi Tetsuji revived it with two long-forgotten acts in June 1962 at the Kabukiza. The michiyuki "Chô no Michiyuki", which is also called "Sukekuni Komaki", is the fifth act of "Keisei Yamato Zôshi". "Chô no Michiyuki" is a travel dance about two butterflies which are the spirits of the tragic young lovers Komaki and Sukekuni, who chose to be united in death since their families would not allow them to be together in life. The two butterflies fly among the flowers, recalling their memories, like their first meeting when they fell in love with each other. They met by chance at the local shrine festival when Komaki's long sleeve was caught on Sukekuni's scabbard. Unfortunately for these two young people, there was a feud between their families, which made their marriage impossible. 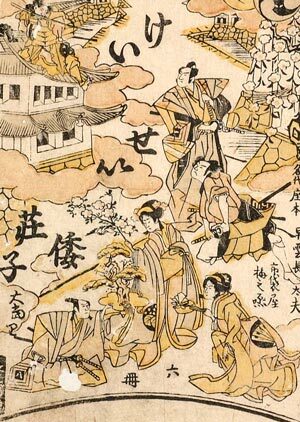 Moreover, their death as substitutes for another couple, Kitabatake Yukienosuke and Princess Yayoi, was also a necessity. They were reincarnated after their death as a pair of butterflies, free to fly together and remember their previous life amid the flowers.